It seeks to ensure the full integration of each employee in his or her working environment, regardless of his or her ethnic or social origin, color, gender, religion, nationality, other distinguishing characteristics. It seeks to ensure that client companies ensure the respect for these values in the working conditions for the personnel made available to them. be scheduled to attend training in the next available course. During this third phase, students will attend the specific courses necessary for their positions within the Company. The PSR/PSD courses are four weeks in duration and will train students in the Team Concept and upon completion of the course of instruction, deploy the students as a Team. The advantage to this concept is that the PSR/PSD Team will have built cohesion and camaraderie and will rotate through deployments as a Team. Differences in personalities, strengths and weaknesses can be addressed during the training phase and personnel effectively managed to achieve the best results and Team effectiveness. Currently, this method is not practiced by PMSC’s as they rotate individuals rather than teams. All PSS operatives will receive training in cross-cultural communications, are given specific regional and area orientation, rudimentary language skills and are sensitive to the environment within which they operate. Each PSS operator is well versed in local laws and customs and implements the rules of engagement using approved escalation of force procedures. This additional training and subsequent certification is what sets our operators apart from our competitors. Training is the key to our success and our training is what will differentiate us from the rest of the market. 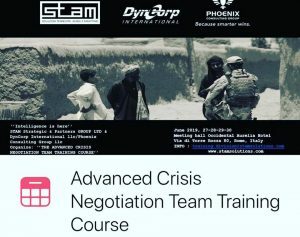 Government agencies that are finding it difficult to access ranges and other training facilities can contract with STAM to use the Training Center. Courses can be taught by STAM’s cadre or by the unit’s trainers.